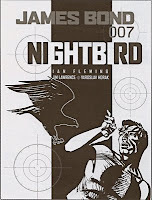 CommanderBond.net reports that Titan Books next collection of classic James Bond comic strips will be Nightbird. The collection will contain the title story as well as "Hot-Shot" and "Ape of Diamonds " Release date is March 23, 2010. First published in June 1976, "Nightbird" finds 007 searching for kidnapped actress Lisa Farrar in Paris and the Aegean. In "Ape of Diamonds" Bond is sent to Cario in search of a mysterious killer gorilla. "Hot-Shot" finds 007 tangling with his old adversary -- Dr. No! This collection, which was originally announced for 2007 and then delayed, will complete the Titan series. Nightbird is now available for pre-order at Amazon.com. Story info from The Bond Files by Andy Lane and Paul Simpson.